According to study "Social Security: an unpayable account", published by the World Bank, Brazil spends a lot on social security benefits to international standards. This value will increase dramatically over the coming decades due to the changing Brazilian demographic structure. 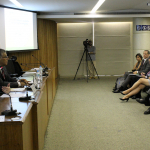 To discuss the Brazilian pension scenario, the World Bank and FGV EPGE will promote a seminar that will bring together Brazilian and international experts.